1-Abrir uma nova imagem transparente de 950 x 650 pxls. _ Select All. Edit Copy no background C-Josy515 \ Edit Paste Into Selection . Selections\ Select none. _Effects\ Image Effects\ Seamless Tiling. Default. _Adjust \ Blur\ Gaussiam Blur. R=46,00. 2-Plugin \ Carolaine and Sensibility \ CS-HLines... 14\0\10. _Effects \ Geometric Effects \ Skew ...Vertical \ A=45\ Repeat. 3- Plugin Graphics Plus \ Quik Tile I ( 128\128\128 ). _Effects\ Image Effects\ Seamless Tiling. Side by side. _Effects \Reflection Effects \ Rotating Mirror . H = 0 \ R= 180 \ Repeat. 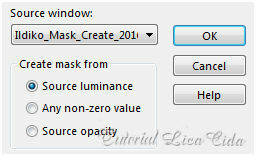 4- Aplicar a mask Ildiko_Mask_Create_2016_05_21_032. _Effects\3D Effects\ Drop Shadow. 2 \ 2 \ 80 \ 2,00 . (Color=#000000). 5-Nova layer . Preencher com color=#ffffff. Usar no background. 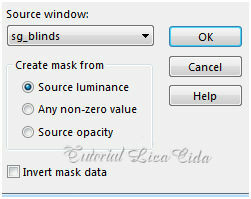 _ Aplicar a mask sg_blinds. _Ativar a layer inferior ( group-copy of raster1 ). Promote Selection to Layer. 7-Plugin Alien Skin Eye Candy 5: Impact\ Glass... Setting\ use Setting\ katrina. 10-Plugin Alien Skin Eye Candy 5: Impact\ Glass... Setting\ use Setting\ katrina. 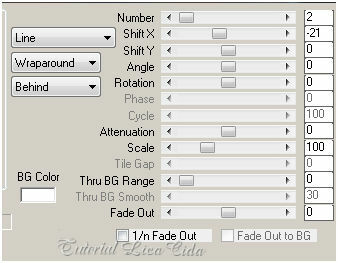 11-Effects\ 3Deffects\ Chisel. ( print ítem 8). 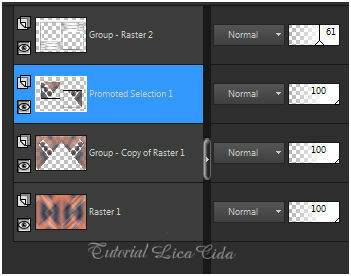 _Ativar a Promoted Selection. Layer\ Merge Down. 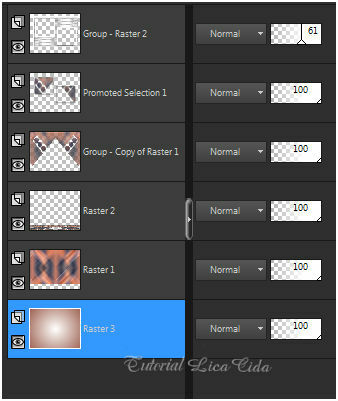 12-Ativar a Group-Copy of Raster1. _Image\ Canvas Sise 950 x 750 _Bottom 100. _Selecionar a parte transparente com a ferramenta Magic Wand_ Default. _ Edit Paste Into Selection. _Plugin MuRa's Meister \Perspective Tiling _Default. 14-Escolha uma cor na raster1. ( #a16557 ) Usar no foreground. _Nova Layer\ Send to bottom. _Preencher com o gradiente Sunburst \Repeats 0. Invert marcado. CP: H e V= 50 \ FP: H e V=50. 15-Ativar a layer superior . Group-Raster2. _Edit Copy \ Paste As New Image . 17- Image \ Resize 30% na imagem copiada. _ Edit Copy \Paste As New Layer no seu back. 18-Plugin MuRa's Meister \ Copies_Line. _ Plugin MuRa's Meister \ Copies_Line ( veja print ). _Posicione a gosto. Layer\ Merge Down. 20- Edit Copy nos decos anexados 1 e 2 \ Paste As New Layer. Use a gosto. 21- Image add border 1 pxl cor #ffffff. _Image add border 3 pxls cor ##a16557 ( fore ). _Image add border 1 pxl cor #ffffff. _Image add border 40 pxl cor a gosto. _Preencher com o gradiente formado no ítem 14. 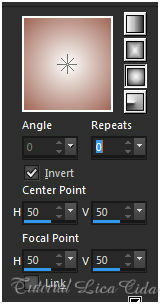 _ Plugin Simple \ Top Left Mirror. 23- Plugin Graphics Plus \ Quik Tile I ( 128\128\128 ). _ Adjust\ Sharpness\ Sharpen More. _Effects\3D Effects\ Drop Shadow. 0\0\80\40,00 (Color=#000000). 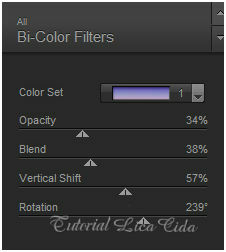 24- Plugin Nick Software\ Color EfexPro 3.0\ Bi-Color Filters\ Color Set \ Violet /Pink1. 25-Edit Copy no tube 101_Femme_Page6_Animabelle \Paste As New Layer. Posicione. 26-Edit Copy no Mina@.vasi.bianchi.10.03.16\ Paste As New Layer. Posicione. _Image add border 2 pxls cor #ffffff. Aparecida \ licacida , março de 2017.